Plus, stylish all-in-one PCs, smart coffee makers tested, the 3D printer every home should have, and loads more! It's time for our annual 101 Gadgets You Can't Live Without list – this is the tech that, once you try it, you’ll never want to go back from. 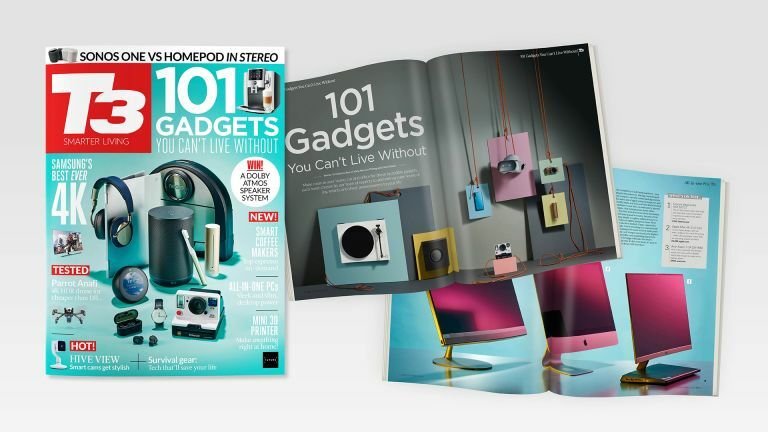 There’s everything from smart home upgrades that give you peace of mind, to super-flexible laptops that help you work and play harder, to kitchen gadgets that turn you into a master chef overnight, to amazing home theatre speakers – and almost 100 more! And that's just one part of the latest issue, of course… you can read a sample below to see what else is there, or read on for more! Plus, right now, we're offering a FREE super-stylish Native Union Eclipse gadget-charging station, worth £69.99, with print or print+digital subscriptions to T3! Get a FREE Native Union Eclipse gadget charger with print or print+digital subscriptions! Also in this issue: we test the latest smart coffee machines, stylish all-in-one PCs, Parrot's 4K HDR drone, Sonos One and HomePod stereo setups, the best cordless vacuums, and even tech that could literally save your life when you're out in the wilderness. Plus even more packed throughout the issue!